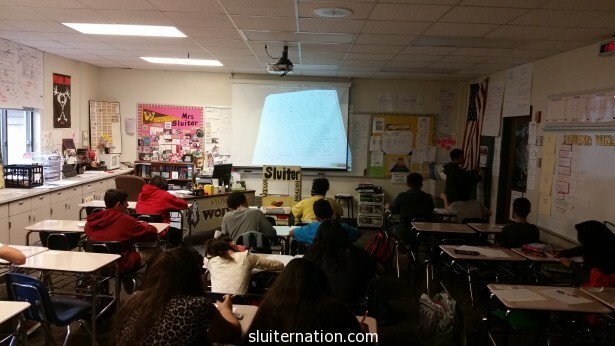 You are here: Home / Sluiters / Katie / Oh Yeah, I Teach Too. Oh Yeah, I Teach Too. I realized today that I am constantly answering that question in real life, but have been weirdly quiet about it here. Today was the last day of the first marking period. One quarter of the school year is already over. That is sort of crazy to me. I mean, it feels like we just started. Last year was Ok. It was better than I thought it would be, but I told myself I wouldn’t make a judgement based on my first year–one where I was overly tired and emotional due to being pregnant. And one I didn’t finish because of said pregnancy. This year is already a million times better if only because I have much more energy. I mean, I don’t have to waddle my way to the copy room only to need a nap when I get back. So you know, bonus! My Reader’s Workshop is off to a really good start. There are still parts I need to tweak, but the kids are responding well to it. They are enjoying reading what they want to read, and I’ve gotten positive feedback from them on the amount of time I give them to silent read. 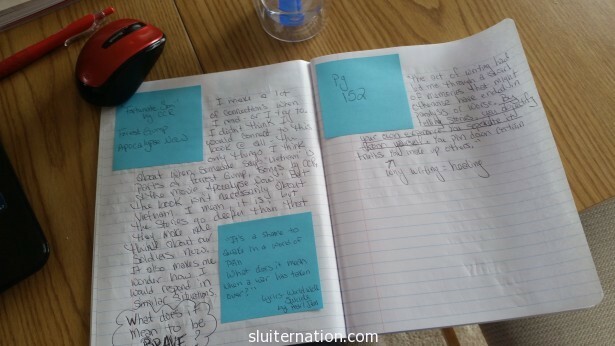 This year I also added the Reader’s Notebook portion where I give them 4-5 minutes to respond to their reading. This part may need some adjusting. I showed the students the notebook that I am keeping, and I share it with them every week so they can get some ideas for their own. Some kids are doing a ridiculously awesome job; others are trying to just get by with a one-or-two-sentence summary each time. My goal is to get kids to think deeper about what they read, but I don’t want it to turn into busy work. It needs to feel like an authentic way to put their own voice into what they are experiencing via the written word. We’ve also been writing. I find that with some of the curricular requirements I have (reading a full-class novel each quarter and doing vocab lists), I don’t have the time to set up workshops the way I would like. I think if it were up to me, our entire class would be set up as a workshop. We would always be in either Reader’s Workshop or Writer’s Workshop mode. I haven’t found a way to do that with us reading a whole class novel and doing sixty vocabulary words a marking period, but I do feel like I am making progress. This quarter we wrote personal narratives using the This I Believe essay format (from NPR). We did each of the steps together: I modeled it, then they did it. I wish we had had about one more week for them to do some peer-work with them. They didn’t turn out exactly as I had hoped. Some kids did fantastic, of course, but overall I felt I could do a better job. The last thing I have incorporated this year is the anchor chart. I have full-on-embraced those things and the kids love them! I have been making them for everything! 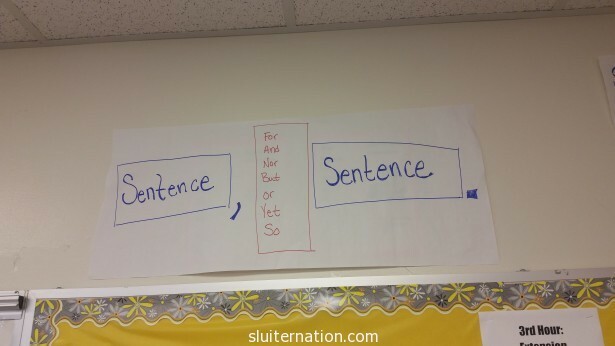 We have character charts, plot maps, grammar charts, critical reading charts, writing charts…they are EVERYWHERE! All the research I have done supports the use of visual cues as a way to help students absorb what they learn, so I do it. I’ve been working hard to write about what I’m doing and what is best practice over at The Educator’s Room as well as sites like Nerdy Book Club, Writers Who Care, and others. I also presented again at the Michigan Council of Teachers of English (MCTE) conference. While I feel good about what I am doing and where I am going and my level of involvement in my own professional development, I guess I haven’t written about it because I don’t want to toot my own horn too much. I mean, as I typed up each of the above things, my head was swimming with the kids I’m still not reaching, what we still need to work on, and how I could do it better and more efficiently than I am now. I’m reluctant to yell, LOOK AT ALL MY AWESOME, when I feel like it’s not the level of awesome it could be. I mean, the ideas are awesome. The practice COULD be awesome, but it still needs work. So yes, the school year is going great…but I am also still working on it. Love hearing about what’s going on in your classroom- and please, toot! We teachers don’t share enough of the awesome! I still need you to come and teach here in Merritt, we need people like you! Also, that last picture? I might print that and tape it on my desk… English is hard for this German girl!